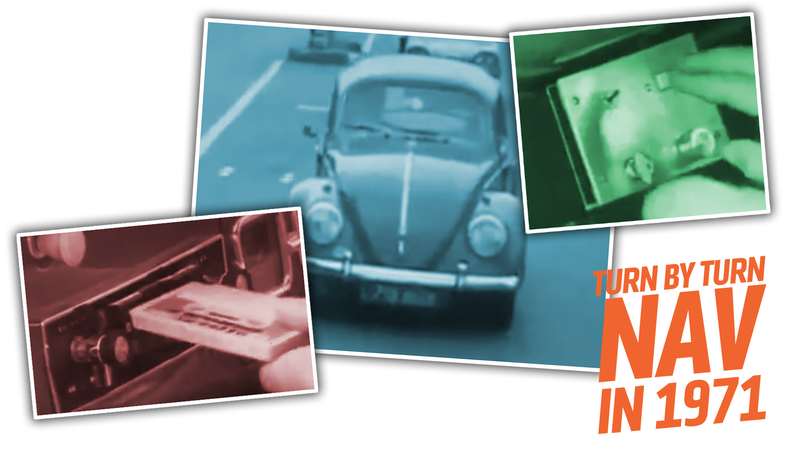 This clip from a 1971 episode of the BBC television show Tomorrow’s World has so many appealing details to me, most notably the featuring of a lovely UK-spec 1962 Volkswagen Beetle, but the true star of it is the remarkably forward-thinking navigation system the Beetle is fitted with. It uses some cutting-edge technology of the era, yet is still quite simple, and it even seems to work, in a limited way. Let’s look at this wonderful and mostly forgotten bit of tech. Look at that; it operates an awful lot like how voice navigation works via Google Maps or Apple Maps or whatever; the driver gets voice instructions about their next, upcoming move—where to go or turn—based on the specific location of the car. This 47-year old system somehow manages to do this without any satellite or cellular communication or even a real computer. Of course, it’s far, far more limited than modern GPS systems, but within its parameters, it’s really clever. The system works by having individual trip driving instructions recorded on cassette tape—or, as the host quaintly calls it, a “cassette of tape.” Keep in mind that cassettes themselves were still fairly new; cassette players didn’t come out until around 1964, and in-dash automotive cassette players weren’t widely available until about 1968. Just playing the cassette of someone telling you driving instructions would be pretty useless, and probably not even good as music, so there have to be other components here. This is where things get really interesting. The taped verbal instructions also play beeps of varying lengths. The duration of these beeps is detected by a box of electronics under the dash, and the length of beep is translated into how many miles the car must travel until the next instruction is played. To calculate this, the electronics box is connected to the car’s odometer via what looks to be a physical/mechanical cable connection that drives a gear-based mechanism inside the box, which allows the number of miles to be tabulated, and, when the number of miles equals the value provided by the tone duration, the next instruction is played. This is a clever system, and the contents of that box form what I think is a simple analog computer. The really innovative thins it’s doing here is reading data from a cassette tape—this just might be one of the first examples of a standard cassette tape like this being used to store and read computer data, a good five or six years before the practice became common in the very first wave of home computers. This idea, a cartridge-like circuit board containing not a stored program in a ROM chip but a series of jumpers or other components designed to alter some parameters on a main “program” also shows up the same year in the first home videogame console, the Magnavox Odyssey. So, let’s look at what this proto-nav system can do: give you turn-by-turn directions to a selected location based on the distance you’ve driven. That’s pretty good, really. Of course, if you take any detours or make a mistake, you’re pretty boned; it’d be good if the system had a sort of “pause mileage count” or “return to last step and re-calibrate mileage” buttons, both of which seem entirely possible. This thing does a lot with a pretty limited set of hardware. I’m impressed. That’s why the fact that I have yet to find out who made this thing is so maddening; I want to give someone or some company credit, but the unit seems to be a prototype, and there’s no mention or markings to suggest who or what made it. I can’t determine what’s written on that cassette. If anyone knows anything, I’d love to know.